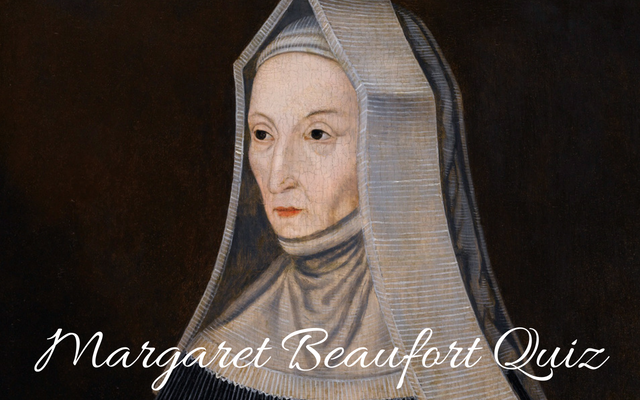 How much do you really know about Margaret Beaufort, mother of King Henry VII? Here is your chance to test your knowledge! Who were Margaret Beaufort’s parents? Born on the 31st of May 1443, Margaret was the daughter of John Beaufort, 1st Duke of Somerset and Margaret Beauchamp. Margaret’s father was descended from King Edward III. Which of the following men was Margaret NOT married to? Margaret never married Jasper Tudor, he was her brother-in-law when she was married to his brother Edmund. Margaret was Countess of Richmond and Derby. Which son of King Edward III was Margaret descended from? Margaret was descended from John of Gaunt and Katherine Swynford. Swynford was Gaunt’s mistress until they eventually married. Their children were barred from the line of succession, but they were legitimized by King Richard II and the Church. Which of the following battles did NOT happen during Margaret’s lifetime? The Battle of the Spurs occurred in 1513. Margaret died in 1509. Upon the death of Edward IV in 1483, Henry Stafford, 2nd Duke of Buckingham (Margaret’s nephew) allied himself with Margaret and her son Henry. True or False? Buckingham assisted Edward IV’s younger brother Richard and helped him succeed to the throne as Richard III in lieu of Edward’s living sons. Margaret died at Westminster Palace, how old was she when she died?